Here at Country John’s Portable Toilet Rentals / Dennis’ Septic Service, we offer rental toilets in a variety of sizes and styles, so we’re certain to have the perfect units for your needs. Your options include the most basic, standard community models to larger, more elegant models befitting women wearing formal gowns, and those who need assisted accessibility and others needing special accommodations. Each of our portable toilet units come with hand sanitizers. We also have models that include potable water for flushing. • Portable sinks with anti bacterial hand sanitizer. Each customer is different in the duration of time and the number of units they require. Please use this form to request a quote, and we will get back to you with rates as quickly as possible. 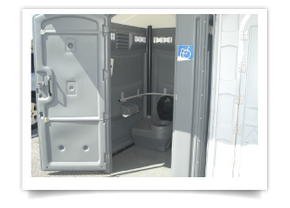 *All of our toilets are the same size, except for our wheelchair units, which are extra big.